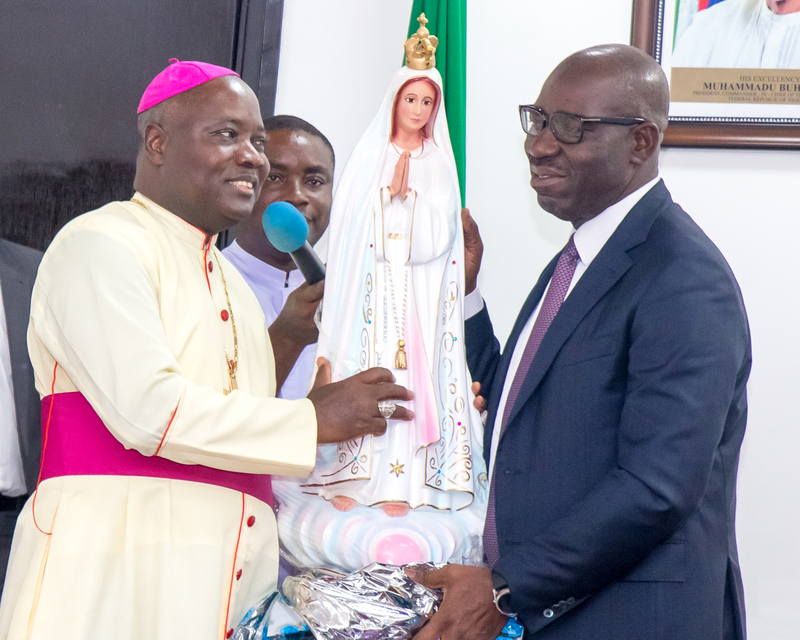 The Governor of Edo State, Mr Godwin Obaseki, has assured the Catholic Bishops of Nigeria of his administration’s drive to improve basic, vocational and technical education, social welfare and healthcare service delivery in the state. The governor said this when he hosted Bishops from the Catholic Bishop Conference of Nigeria (CBCN), led by their President, the Archbishop of Jos, Most Reverend Ignatius Kaigama, at the Government House, Benin City. The visit is part of CBCN’s activities to mark the commencement of its 3-day National Marian Congress, holding in Benin City. Obaseki said the state government is open to collaborating with the Catholic Church in areas of mutual interest, especially in ensuring social cohesion, welfare provision and religious harmony. “This administration has an open-door policy to collaborations. We are willing to work with anyone that has a mission to support our efforts to improve education, social welfare and health care system. These sectors are capable of bringing about desired social change in the state,” he said. The governor commended the decision of the CBCN to host its national congress in Benin City, noting that the preference to hold such a high-powered event in the state doesn’t only prove that the state is safe, but that it is also blessed. President of CBNC, Most Reverend Ignatius Kaigama expressed his appreciation to the state governor and people of Edo State for the warm reception accorded to the Bishops and other congress participants. Archbishop of Archdiocese of Benin, Augustine Akugbueze, extolled the leadership qualities of the governor, noting that the ongoing rehabilitation and constructions of roads, is testament to a commitment to the needs of the people. He also lauded the governor’s drive in the creation of jobs for youths since his assumption of duty. Archbishop of Jos, Most Reverend Ignatius Kaigama (left), presenting a statue of the Lady of Fatima/Virgin Mary to Governor Godwin Obaseki of Edo State, when the governor hosted Bishops from the Catholic Bishop Conference of Nigeria (CBCN), at the Government House in Benin City, on Thursday, October 12, 2017.